Stars are so far away that we have no hope of ever reaching them. So how can we learn about the temperature of stars? Compare the temperature of the red star Antares with the temperature of our yellow star, the Sun. Antares is cooler than the Sun. The Sun is cooler than Antares. Temperature cannot be determined with the information given. With a spectroscope you can see an emission spectrum when you look at a tube of hot glowing gas. What does an emission spectrum look like? With a spectroscope you can see an absorption spectrum when you look at a cool gas with a light source behind it. What does an absorption spectrum look like? With a spectroscope you can see an continuous spectrum when you look at a hot, solid, glowing object. What does an continuous spectrum look like? You are using a spectroscope to look at a hot, glowing, solid object. Between you and the hot object is a tube with some cool gas in it. What type of spectrum will you see? You are using a spectroscope to look at a hot, glowing gas. A bushed-looking astronomy student walks into class mumbling, "Oh Be A Fine Guy, Kiss Me". What is she trying to remember? Which is hotter, a K3 star or a F5 star? Which sequence of spectral types (from hottest to coolest) is incorrect? Which of these is an emission spectrum? Which of these is an absorption spectrum? Which of these is an continuous spectrum? A bushed-looking astronomy student walks into class mumbling, "Roy G Biv". What is he trying to remember? Wien's displacement law says that as a material gets hotter, the peak intensity of radiation given off by the object shifts toward shorter and shorter wavelengths of light. a hot star will be "bluer" than a cooler star. a hot star will be "redder" than a cooler star. that all stars are white hot. What is the color of a 7500 K object? What is the color of a 6000 K object? What is the color of a 4500 K object? What is the color of an object that emits at a peak of 5000 angstroms? What is the color of an object that emits at a peak of 7000 angstroms? What is the color of an object that emits at a peak of 4000 angstroms? How would a yellow star appear different if it were to become hotter. It might become orange or red. It would become white or blue. It would not change in color or brightness. How would a yellow star appear different if it were to become cooler. Other than color, how would an object at 4500 K appear different from an object at 7500 K? The 4500 K object would be brighter than the 7500 K object. The 7500 K object would be brighter than the 4500 K object. The only difference would be color. They appear identical in every way. Other than color, how would an object emitting at a peak of 4000 angstroms appear different from an object emitting at a peak of 7000 angstroms? The object emitting at a peak of 4000 angstroms would be brighter than the object emitting at a peak of 7000 angstroms. 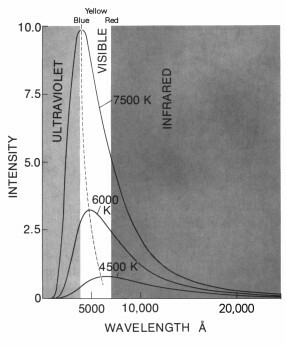 The object emitting at a peak of 7000 angstroms would be brighter than the object emitting at a peak of 4000 angstroms. So why do stars have such a wide variety of different looking spectra? The stars are of different temperature. The stars are of different brightness. The stars are made of different substances. All stars have very similar looking spectra. Why is it that only the coolest stars show molecular spectral lines (bands)? The bonds that hold molecules together are destroyed in hotter stars. The hotter stars have larger molecules. The cooler stars have vastly different amount of hydrogen and helium. Color depends on what characteristic of light? An excited atom decays to its ground state and emits a photon of green light. If instead the atom decays to some intermediate state, then the light emitted could be which of the following? An excited atom decays to some intermediate state and emits a photon of yellow light. If instead the atom decays all the way to the ground state, then the light emitted could be which of the following? A hypothetical atom has four distinct energy states. Assuming all transitions are possible, how many spectral lines can this atom produce?